Cleans & foams with every flush. Clear water.With a concentrated cleaning action designed to prevent limescale. For up to 8 weeks* * Each block lasts up to 4 weeks. No need to remove the pleated wrapper as this will dissolve in the water. Drop the block into the cistern at the opposite end to the water inlet, by the float (see picture). Allow 10 minutes for the block to settle before flushing. For best results clean the toilet thoroughly to remove existing limescale deposits. 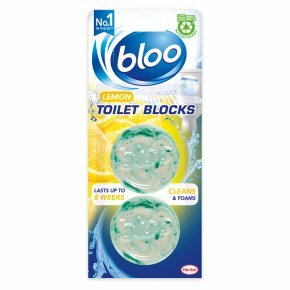 Continue the Freshness Replace with a new bloo block as soon as the colour starts to fade. Safe to use with septic tanks and all other toilet cleaners. Use only as directed. Do not use in porous, crazed or cast-iron cisterns. BLOO CITRUS ZEST IN CISTERN BLOCK 2 x 38 g<br>Danger: Contains: Sodium Dodecylbenzene Sulfonate & Sodium Olefin Sulfonate. Keep out of reach of children. Causes skin irritation. Causes serious eye damage. Harmful to aquatic life with long lasting effects. If medical advice is needed, have product container or label at hand. Wash contaminated skin thoroughly after handling. IF ON SKIN: Wash with plenty of soap and water. IF IN EYES: Rinse cautiously with water for several minutes. Remove contact lenses, if present and easy to do. Continue rinsing. If eye irritation persists: Get medical advice/attention. Contains Butylphenyl Methylpropional, Citronellal, Dimethylcyclohex-3-ene-1-Carbaldehyde, Geraniol. May produce an allergic reaction.